Of all the projects Robert Wyatt created apart from his tenure with Soft Machine and Matching Mole, The End of an Ear has to be the strangest, and among the most beautiful and misunderstood recordings of his career. 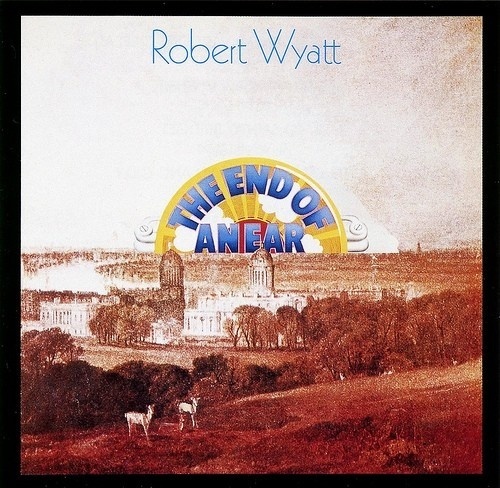 Recorded near the end of his membership in Soft Machine, End of an Ear finds Wyatt experimenting far more with jazz and avant-garde material than in the jazz-rock-structured environment of his band. The Wyatt on The End of an Ear (a play on words for the end of the SM era, and another session called "Ear of the Beholder") is still very much the fiery drummer and percussionist who is interested in electronic effects and out jazz and not the composer and interpretive singer of his post-accident years. Influenced by Miles Davis' electric bands and the fledgling Weather Report who did their first gigs in the U.K., Wyatt opens and closes the album with two readings of Gil Evans' "Las Vegas Tango, Pt. 1." These are the most structured pieces on the recording, and the only ones not dedicated in some way: "To Mark Everywhere," "To Caravan and Brother Jim," "To Nick Everyone," "To the Old World (Thank You for the Use of Your Body, Goodbye)," "To Carla, Marsha, and Caroline (For Making Everything Beautifuller)," and others. The titles reveal how personal the nature of these sound experiments can be. Wyatt, because of his association with many in the Canterbury scene, not the least of which is SM mate Elton Dean who prominently appears here, was learning alternate structures and syntax for harmony, as well as the myriad ways rhythm could play counterpoint to them in their own language. The interplay between Wyatt, bassist Neville Whitehead, cornet player Marc Charig, and alto man Dean on "To Nick Everyone" is astonishing. Wyatt creates time from the horn lines and then alters it according to Whitehead's counterpoint both to the formal line and the improvisations. Toward the end of the track, Wyatt's piano is dubbed in and he reveals just how expansive he views this new harmonic approach. The piano becomes a percussion instrument purely, a timekeeper in accordance with the bass, and the drums become counterpoint -- in quadruple time -- to everyone else in the band. When David Sinclair's organ enters the fray and another piano courtesy of Mark Ellidge, as well as assorted percussion by Cyril Ayers, the entire thing becomes a strange kind of rondo in free jazz syntax. Elsewhere, on "To Caravan and Brother Jim," a 2/4 time signature opens the track and the organ plays almost a lounge-jazz-type line with drums rumbling in the back of the mix, almost an afterthought, and Ellidge's piano stumbling in with dissonant trills and riffs until he creates a microtonal line against the organ's now carnival chords until certain drums fall out, then back in, and the piano plays an augmented chord solidly in glissandi until the piece just sort of falls apart and ends. If you are Robert Wyatt, this is the way you find something new, you "play" at it. And that's what is so beautiful about The End of an Ear -- the entire record, unlike the "seriousness" of Soft Machine Third, is that this is being played with tonalities, harmony, language, and utterance that are all up for grabs in an investigation of freedom both in "music" and "sound." The End of an Ear is the warm and humorous melding of free jazz amplification and musicians' playtime.